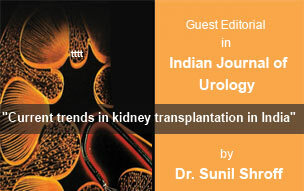 Dr. Sunil Shroff, MS, FRCS ( UK). Urol Dipl ( Lond.). Death can bring life is a unique concept new to mankind. The Egyptians were perhaps the first to believe in it and took elaborate measures to preserve the body by the complex process of embalming. In modern times, the field of preservation of tissues has constantly looked at newer methods of preserving tissues and organs after death. Preservation of cells is dependent on the complexity of their function. The more complex the function the lesser time the tissues can be preserved outside the body. Skin, bones, cartilage, arteries and veins are essentially structural tissues and have the ability to be preserved for many years whereas cells of organs like liver, heart, pancreas, lungs, kidneys, and intestine can only be preserved for few hrs to a few days. 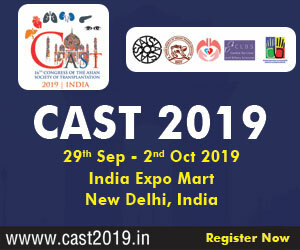 The concept of Brain Death is more recent and its acceptance as an entity has provided a boost to the whole organ donation and transplant programme in the world. In brain death patient it is possible to preserve the required hemodynamic stability to keep the critical organs alive by providing them with oxygen and nutrition. Organ donation in a brain death situation is a positive outcome of death which sometimes maybe unnecessary as it happens in road traffic accident. Over 50% of Brain Death involves young people with head injury due to a road traffic accident. The tragedy for the family members of the deceased at this unnecessary loss of life is immense. Organ donation is perhaps the only positive outcome of this grave tragedy provided the relatives agree to the process. However one must always remember that the condition was not invented for the benefit of organ donation and the wishes of the loved ones should always be respected and no pressure should be put on the relatives to donate. Ideally they should be aware of the concept in advance and should come themselves come forward for organ donation. In 1959 two French physicians first recognized Brain Death on patients being ventilated in the intensive care units and called it coma depasse (a state beyond coma). In 1968, an Ad Hoc Committee of Harvard Medical School defined brain death as irreversible coma with the patient being totally unreceptive and unresponsive with absence of all cranial reflexes and no spontaneous respiratory efforts during a 3 minutes period of disconnection from the ventilator. A matter for debate has been how much of brain needs to be actually dead before death can be diagnosed. Experiments have conclusively shown that a few cubic centimeters of tissue called brainstem that is located beneath Aqueduct of Sylvius anteriorly and floor of fourth ventricle posteriorly is the vital section of the brain that determines consciousness and ability to breathe spontaneously. If this tissue is destroyed it will result in brain death. However in certain countries, the whole brain including the brainstem needs to die to diagnose this state of irreversible death. This can be a difficult to diagnose and sometimes requires four vessels (carotid and vertebral) angiography and Isotope studies of the cranium. In contrast the tests to diagnose brainstem death are more clinically oriented and over the last 35 years have stood the test of time. They are simple, clinical, fool proof and capable of confirmation of brain-stem death. In 1988 the Irish working committee on Brain Death in its memorandum said, if the brainstem is irreversibly lost, what goes on elsewhere in the brain is immaterial and Life cannot return. Brain death is similar to physiological decapitation and can result from intra cerebral bleeding or increase in the pressure of the cranium due to a tumor. Increasing intracranial pressure results in coning of the brainstem and ischemia leading to brainstem death. In this situation the heart can continue to beat if the patient is kept adequately ventilated and hemodynamically stable. However this situation cannot be maintained indefinitely and in majority of the situations the patient has hemodynamic instability, electrolyte imbalance and cardiac arrest due to loss of the central receptors. In the last three decades the concept of brain death has evolved and has had judicial approval in many parts of the world. In 1994, India accepted the concept of brainstem death and passed an act to this effect and called it the Transplantation of Human Organ Act (THO). The act also proposed to stop commercial dealing of organs by making regulatory authorities in each state to look into the whole process of organ donation for both live related (or unrelated) and cadaver organ donation and transplantation. As health and education are state subjects this act had to be accepted by various states and passed in their assemblies. So far the act has been passed in most of the Indian states; however there are still a few states that have to accept the act. As per the Transplantation of Human Organ Act two clinicians who are experts in the field (like neurologists or neuro-surgeons) are required for brain death certification. Ethically these clinicians must not have interest in or benefit in any way from transplantation of cadaver donor organs. They are expected to do two sets of tests six hours apart to certify brain death. One of these two clinicians should be a nominated member from the panel of doctors listed by the State Government for this purpose. The legal time of death in these circumstances is taken as the second set of brainstem death tests. The certification should be done on laid out forms as per the act. In a medico-legal case a forensic expert is also required for the certification. The medical director or medical superintendent of the hospital should finally countercheck and sign the form. It is only after this has been done should ventilatory support be discontinued or retrieved. Patient should be comatose and on ventilatory support. Functional reversible causes of a non-functioning brainstem should have been ruled out. These causes include. To check for absent pupillary response to light, a bright pen torchlight should be used in a darkened room. It should be made sure that no eye drops to dilate the pupils have been used in the four hours previously. The pupils may not be necessarily fixed and dilated in the brainstem dead patients; however there should be no pupillary response to light. To test the corneal reflex moist cotton tipped swab should be used and firm pressure should be applied to the cornea without damaging it. The vestibulo-ocular reflex testing involves instilling 20 ml of ice-cold water into the external auditory canal and looking at eyeball movements of either eye for about a minute. No eyeball movement indicates absence of reflex. Presence of ruptured eardrums or discharge from the ear prevents this test from being performed. Testing of gag and cough reflex requires temporary disconnection from the ventilator. A cotton tipped swab can be used to stimulate the posterior pharynx to look for a response. Experienced ICU staff usually notice a progressive loss of response during the evolution of brainstem death when performing the routine suction of airways and oropharynx. The plantar response may continue to be present in brain death patients along with spinal reflexes and should not be tested. The decorticate and decerebrate posturing is absent, however on occasions it may be difficult to differentiate from complex spinal reflexes. The aim of apnoea test is to establish death of the respiratory centre in the brainstem. It demonstrates that the spontaneous respiratory response fails to occur even in the absence of stimulatory drive from CO2. For this test the patient is disconnected from the ventilator for 10 minutes. However, to avoid hypoxia to vital organs, 100% oxygen is given for 5 minutes before disconnection of the ventilator. Even during the test period, 100% oxygen is given through a tracheal catheter. In the patient who is brain dead the carbon dioxide tension increase at a rate of 2mm/min (0.3kPa/min) during apnoea testing. If the initial CO2 tension before testing is about 40mmHg (5.3 kPa), then arterial CO2 tension after 10 minutes is likely to be 60mmHg (8 kPa). However a rise to 50mmHg in CO2 tension is acceptable and should provide sufficient stimulatory drive for spontaneous respiration in an intact respiratory centre. In patients with chronic airway disease or severe chest trauma, the apnoea test may be difficult to perform. Four-vessel angiography is used to show absence of the flow of cerebral blood flow and confirm death of whole brain. However this is cumbersome investigation in an unstable patient and is not done routinely. Nor is it necessary to use EEG to diagnose the condition. If there is any doubt in the diagnosis of brain death, one should not proceed for a request for organ donation and ventilatory support should be continued. In a case of severe facial trauma or presence of paralyses or severe chest trauma routine tests may not be possible and one may require doing special tests like isotope scanning or colour flow duplex scanning of the cranium to confirm brain death. All these tests can have limitations and can sometimes be inconclusive. In these inconclusive situations, if organ donation is being contemplated, the patient’s relatives should be told about it and the ventilator should only be disconnected in the operation theatre and organ retrieval started only after cardiac standstill. The Transplantation of Human Organ Act does not require investigations like cerebral angiography or EEG brain death certification. In children there remains uncertainty about the reliability of clinical brainstem testing. In neonates, especially organs for transplantation should not be removed in the first seven days of life with beating hearts. Radioisotope brain scanning has been recommended under the age of one year when brainstem death certification is required.